Is there a lightweight tool to crop images quickly? I need to crop images often - photos, printscreens, etc., and loading gimp for such a simple task takes way too long. Can you recommend a faster alternative? Gthumb is a nice image viewing/editing tool with simple editing tools like cropping. Once finished press Enter or Crop. Then, in the Edit sidebar press Save to overwrite the original file or Save As to save to a new image file. On the command line, the tool to manipulate bitmap images is imagemagick or graphicsmagick (GM is a split of the IM project, and more actively developed). This is a good option if you often use the same parameters. For ad hoc use where you need to see each image, you can use display (also from the ImageMagick suite) or gm display (GraphicsMagick) or Shotwell or Pinta or many other image viewers with light editing capabilities. 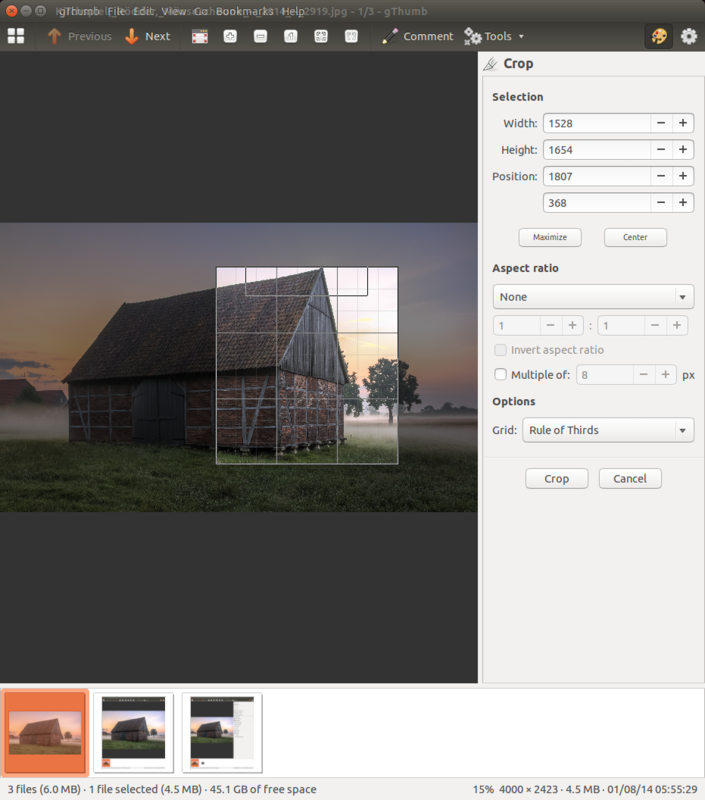 You can crop and export pretty quickly with Shotwell, it's pre-installed. Failing that try Pinta, it's in the Software Center. Batch jobs and command line programs don't work too well for cropping if you have lots of different things you want to crop (i.e. the subject is in different areas in each image). Image editors like gimp and even some lightweight viewers still annoyingly have crop hidden under a bunch of menus and then to throw load/save on top of that means most of your time is spent on navigation. 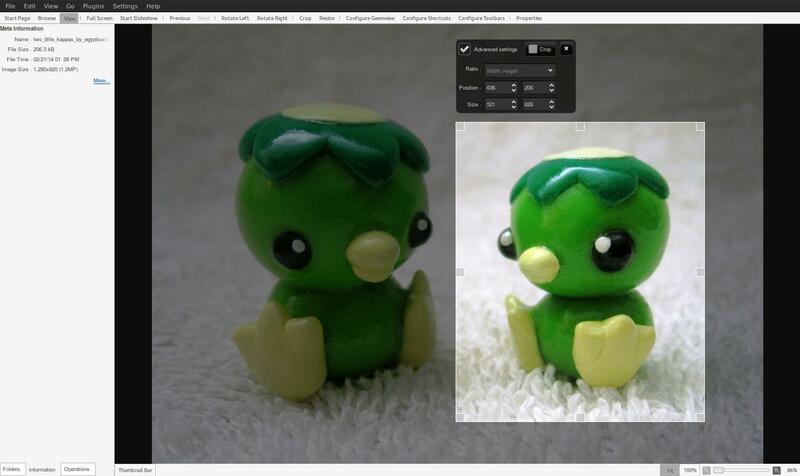 Uses imagemagick to do the crop, python/tkinter for the preview. It automatically runs through all images in a directory, click the area to crop, scroll to adjust size, then space to save (in a subdirectory) and load the next image. It does just lossless JPEG cropping. How about Gwenview, which is a highly customizable and easy to use image viewer/image managing application. 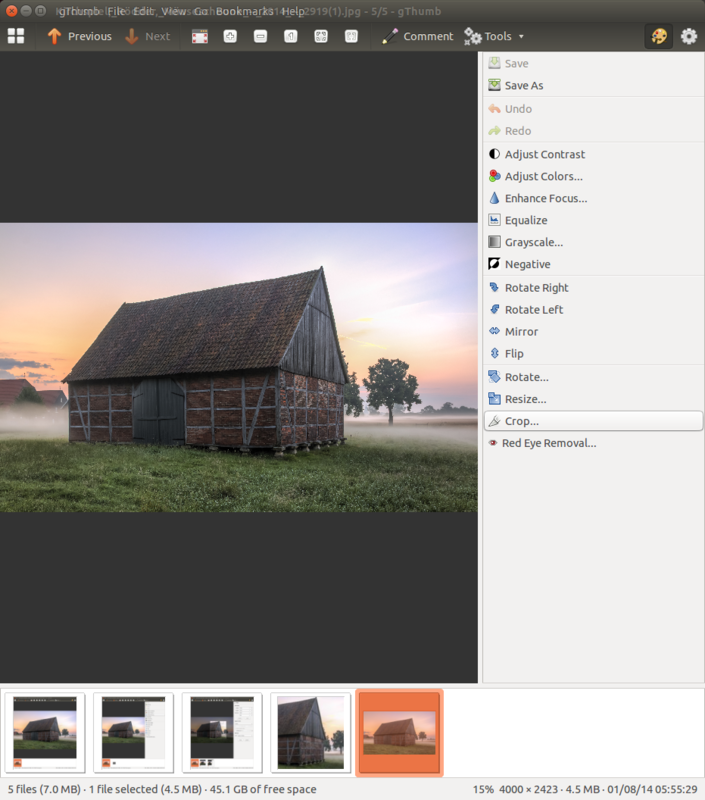 Also supports simple image manipulations: rotate, mirror, flip, and resize, basic file management actions such as copy, move, delete and others. It is a Lightwave Application (with MB) and can be extended using KIPI plugins. ImageMagick. Launchable from CLI with $ display <img>. Has visual cropping. Very lightweight (about 10Mb aside from dependencies), requires little more than libx11 and GNOME's libxml2. I use mogrify on the command line. Go to the folder you want to modify. Done. It runs very fast. I just did several thousand images in 1 second. Resizing is quite a bit slower. XnViewMP or IrfanView (under Wine). They worked for me ever since the Bronze (Windows) Age. 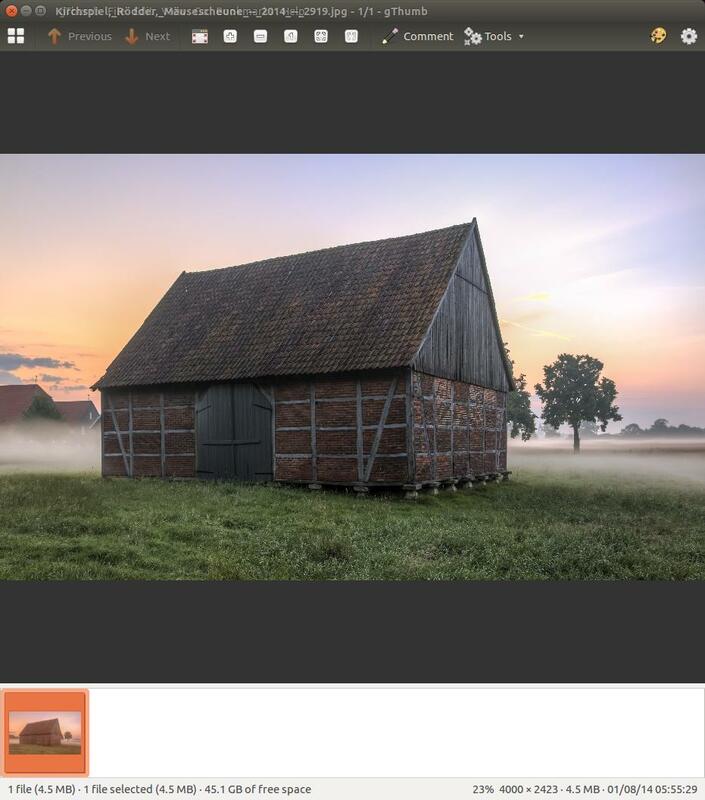 An image can also be opened with a viewer but then cropped with a screenshot tool. There are many such tools depending on the desktop. 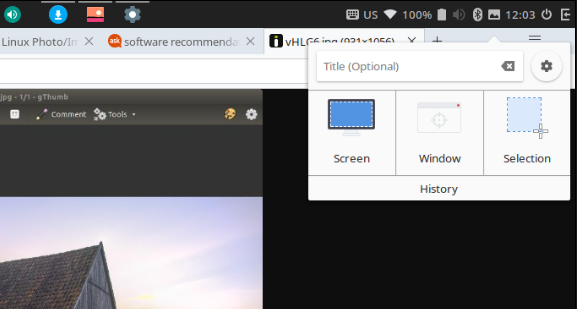 As now there is an Ubuntu Budgie I'll take that example: Budgie has a panel applet to easily capture and save images; it may need to be added to the panel from the budgie settings. 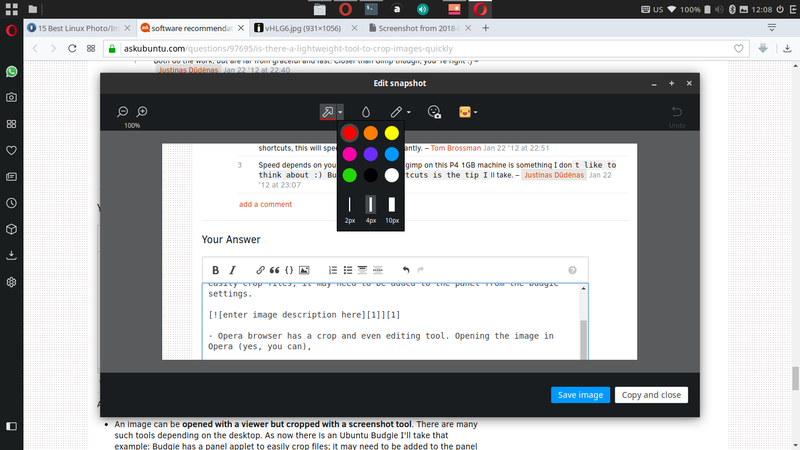 Opera browser has a crop and even editing tool. 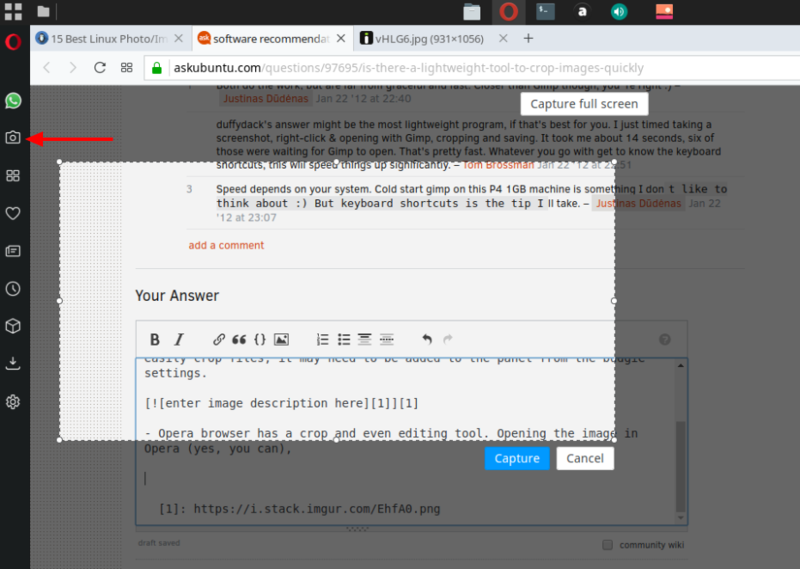 Opening the image in Opera (yes, you can), you can then crop and even add arrows and draw on it before saving. just installed KolourPaint (part of the K desktop environment which appears to include GwenView), and that did it for me. seems stable under RHEL6.5, and i'll try it with Trusty tonight. i have very simple goals with this: support ctrl-V for paste directly after the app is started (something the otherwise great GwenView doesn't support), and simple cropping (in this case, ctrl-T) and copying back to the clipboard for reuse in an office or instant messaging app. it also supports several paint features. still not a full replacement for irfanview (if there even is one...beginning to conclude there really isn't), but i'll live. How to crop borders/white spaces from image? What photo and video manager software? Is there native software similar to Comic Book Life for Linux? Ubuntu or Debian package for creating book covers? Does “diff” exist for images? Is there any “Background Removal” Program in Ubuntu besides GIMP?